This is the artist first Solo Exhibition at the gallery. This exhibition is made in collaboration with Hionas Gallery and in conjunction with Siri Berg: A Life in Color curated by Magnus af Petersens at BONNIERS KONSTHALL in Stockholm, Sweden, May 09 - 10 June, 2018. Since the 1960s, Siri Berg (born in Stockholm in 1921) and thought to be one of America’s foremost abstractionists, has worked with a geometric abstraction, one both strictly reduced and rich in variation and the visually unexpected. Siri’s art consists of three main bodies of work: Paintings, Collages (which are made from Japanese technique woodblock prints) and Assemblages (made from found industrial objects). She uses color and texture to express her stories in total abstraction. The color can be bold and fast forward or subdued and slow motion, as in film. Berg has been a resident of New York City since 1939 and it is where she was first recognized at the time when minimalism was making its breakthrough in the art world. 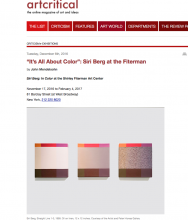 The exhibition in Stockholm, A Life In Color, provides an opportunity to see a concentrated presentation of her abstract painting focusing on Berg’s strong interest in color theory, a subject she taught for 30 years at the Parsons School of Design in New York City. The exhibition at Silas von Morisse gallery, Black & White, focuses on early and rare works from the 1970’s: White Seriesand White Holes which reference symbols of balance and harmony – such as yin and yang or the rondeau, a principle in musical composition. Berg was born in Stockholm, Sweden, in 1921. She studied at the Institute of Art and Architecture at the University of Brussels before immigrating to the United States at the age of 19 in 1939. She worked briefly in interior design until she began pursuing her true passion - Painting and Color. She taught Color Theory at Parsons School of Design for over 30 years and was featured in the book “100 New York Painters” (by Cynthia Maris Dantzic, Schiffer Publishers). Siri is a long-time member of the American Abstract Artists. Her work is in the collections of The Solomon R. GuggenheimMuseum, New York; Southwest Minnesota State University Art Museum MN; New York University, New York; Gray Art Gallery, NYU, New York; Moderna Museet, Stockholm, Sweden (Museum of Modern Art); and many more. She has exhibited worldwide both in solo and group shows, including 3 recent shows in her native Sweden. She lives and works in New York City’s SoHo district since 1982.